A pastel drawing, 28.5 x 22cm, by Dulcie Penny from one of her government-issued schoolbooks. The Myrtle K Benn Collection, 1947. There is a lot to say about this, much of it reflecting the punitive control the then Department of Native Affairs had over Aboriginal people’s lives, including those of the children. When Noel White encouraged the Carrolup children to develop their drawing skills, as outlined in previous posts, both the girls and the boys were involved. 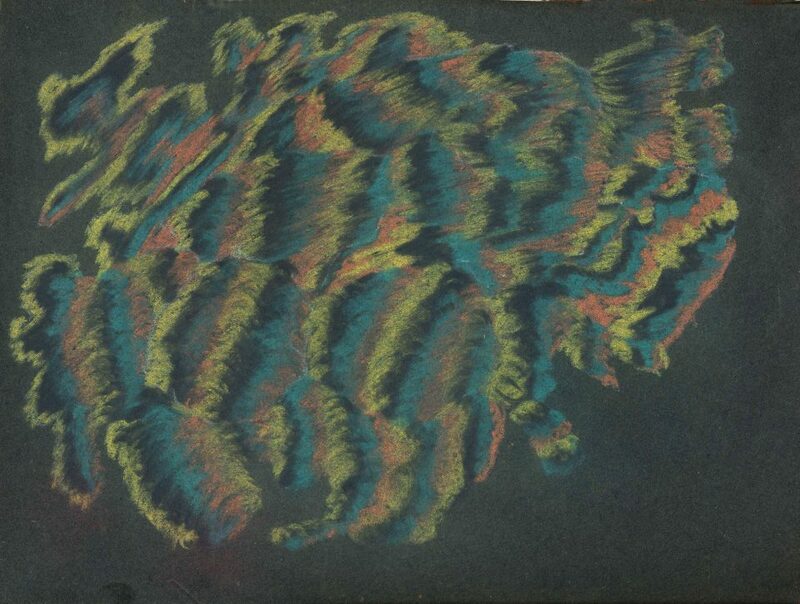 And to begin with, many of their drawings were largely abstract, experimentations with colour and blending. Over time, objects of the landscape started to appear, most vividly depicted in the boy’s drawings. The girls, though, remained preoccupied with abstract geometric designs, as evidenced with images from their pastel drawing books depicted here. When Carrolup was re-established in 1940, it had a key goal: to train the children into ‘useful’ vocations, as these were termed at the time. That is, the boys were to be trained as farmhands; the girls were to be trained as domestic servants for later work with both farming families and those living in the towns. This greatly constrained the activities of the girls, in particular, who were being trained in needlework and housekeeping. The boys, though, were deemed to be too young to actively work on the Carrolup farm, which required significant manual labour, so the Department initially actively encouraged their artistry until they grew up. Noelene White has recounted to me, on a number of occasions, how the girls were being trained in domestic activity. She possesses needlework created by the girls based on designs developed by Revel Cooper, including a tablecloth decorated with dancing figures [see part of tablecloth shown in our Memorabilia Gallery], and the tapestry cover of the White’s piano seat, which was supervised by Vera Wallam and exhibited in the Berndt Museum’s exhibition, Aboriginal Artists of the South-West: Past and Present (2000), which I co-curated with Noongar artist, Sandra Hill. The girls were also developing their cooking skills with the encouragement of Lily White, who was supervising the kitchen and dining room in 1946. Although I focused on the more recognisable figurative works, mostly created by the boys, for the first exhibition of Carrolup art that the Berndt Museum mounted, Nyungar Landscapes. Aboriginal Artists of the South-West: the Heritage of Carrolup, Western Australia (1992), I thought to myself at the time that a subsequent exhibition of the girls’ drawings and textiles would be an important recognition of the artistry of the Carrolup girls. This remains something for the future. 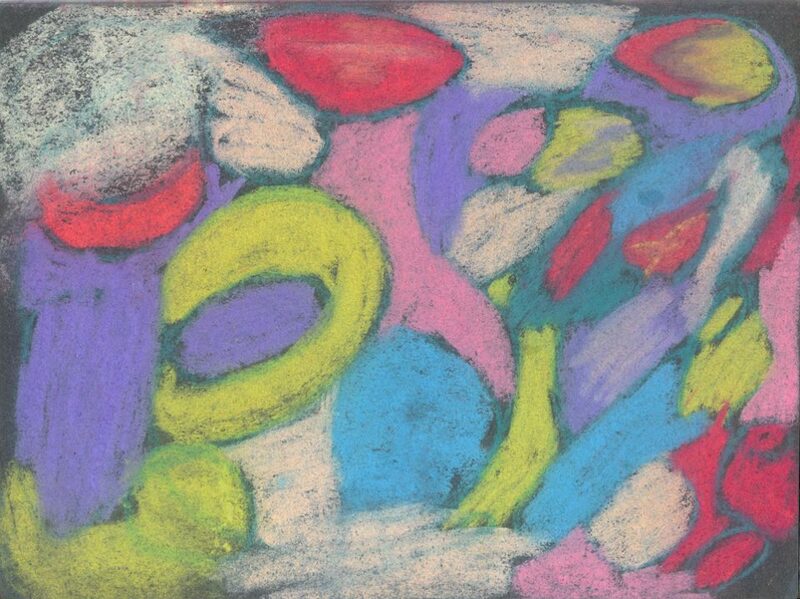 A pastel drawing, 28.5 x 22cm, by Edith Wallam, from one of her government-issued schoolbooks. The Myrtle K Benn Collection, 1947.